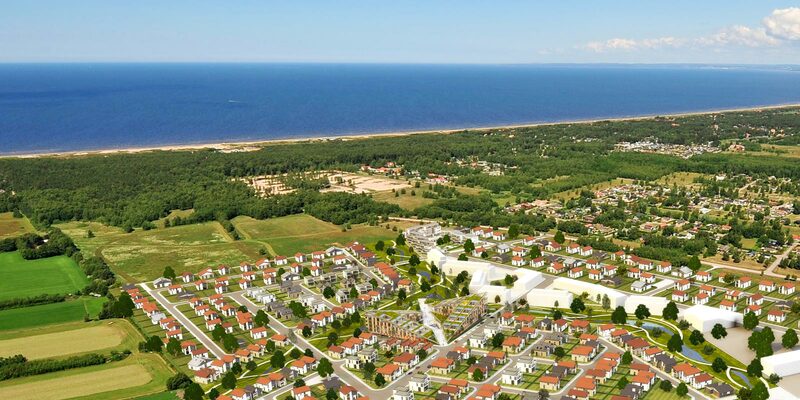 ‘Butterfly Square’ forms the central piece to the Allarp master plan in Halland, situated on the West coast of Sweden, 4 km from Båstad. The phased master plan is currently under construction. The brief asked for a ‘town centre’ to the master plan. The buildings are to have a mix of residential and retail functions and 30 % of the plot is to be devoted to external space. A town square is a special kind of space that allows people to collect together for a variety of reasons. It has always traditionally been the place to meet and usually contains the local landmark building. Sadly today, many town squares seem to be a place to park cars. They fail to provide many of the spaces that we enjoy spending time in as part of our evolving needs. We believe a modern square should consist of a range of spaces which work together for multiple activities and for people of all ages and abilities. 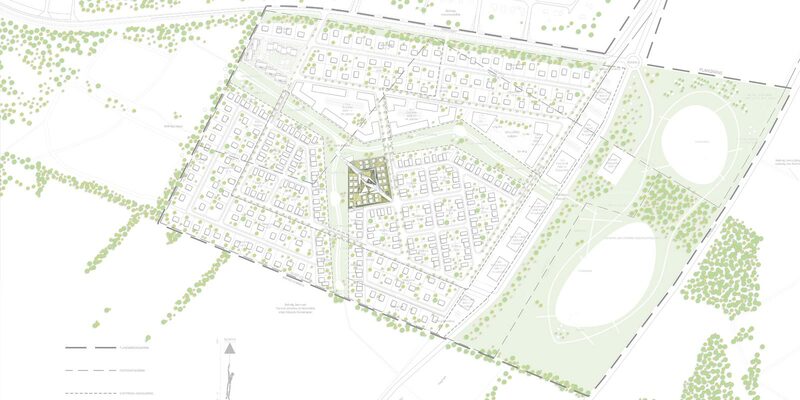 The design evolved through thinking about the range of spaces we felt the masterplan would benefit from. We wanted the spaces to be a pedestrian, child friendly environment, that was made up of a small series of spaces that could work together. We also wanted the square to feel different, and in many ways feel part of the nature park flowing in. The concept is a series of spaces linking to the nature park through a building that presents itself as the open wings of a butterfly. A diagonal route through the site has been created. This route connects the wider masterplan to the nature park. It also provides a route towards the relocated Båstad station, which open late 2015. The route divides the space into two parts or ‘wings’. This gave two plots of land on which to build. 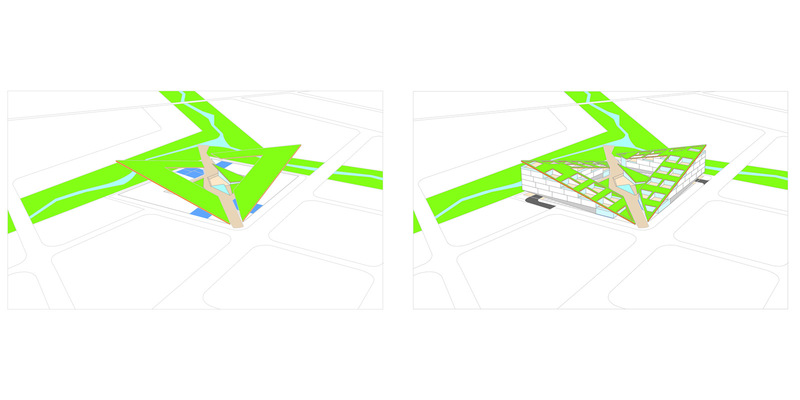 Leaving the central space alone , we developed 2 ‘L’- shaped building plots. Knowing that parking is always an issue, we decided to eliminate this by placing parking at ground floor within the building footprint. The building are raised above this. It allowed us to have access and views towards the centre from around the site perimeter. 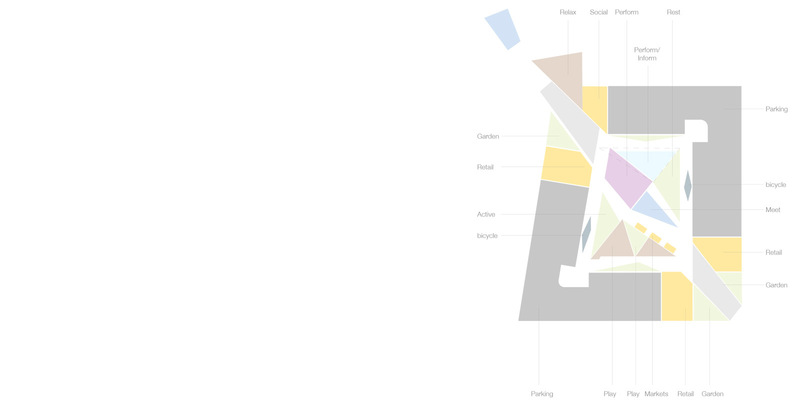 We have developed the centre to be layered and versatile, one which can adapt to many changing needs. The route through the centre divides the central space into 2 main areas. Each of these areas form the framework to be further sub divided, depending on the function required. Spaces for socialising, meeting, playing, informing, relaxing, shopping, exploring and performance have been considered . At the centre of the square a lowered space has been created with perimeter steps. A simple glass building is created by lifting up a piece of landscape to form the roof of the performance zone. This allows the space to be the backdrop for performances, shows exhibitions and the like, with the steps becoming amphitheatre style seating. Many town squares are lined with sterile buildings and retail areas surround the space. We understood that this place needs to accommodate some local convenience functions. We also however wanted to make the square feel less introspective. Placing the retail spaces at the ends of each building gave 4 templates. This offers not only multi point access, but also through light, which gives a level of transparency and light. We designed the retail spaces with flexibility in mind. Giving the opportunity to have numerous smaller units, that aim to promote local quality produce. 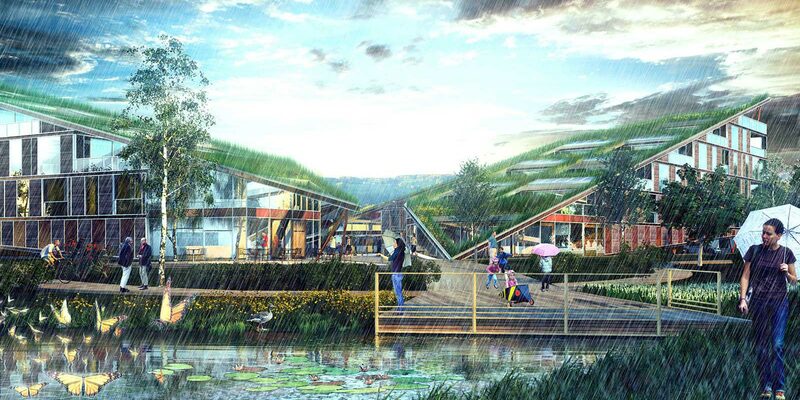 The buildings have been designed to be a part of nature and add to the beautiful surroundings. To achieve this we took the whole building footprint and filled this with landscape. The footprint then is lifted to form the roof of the buildings. 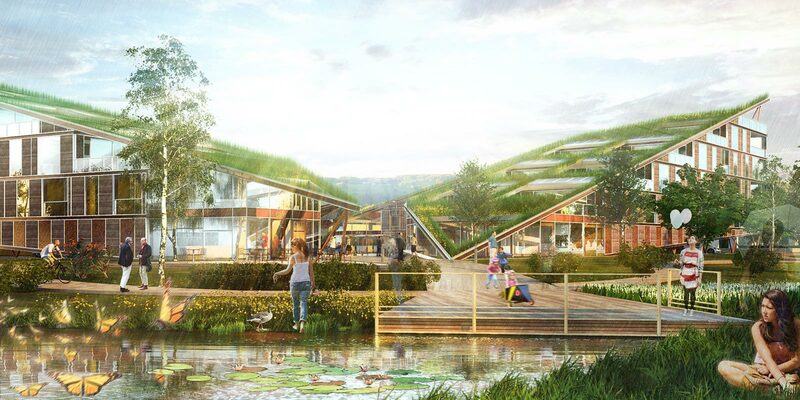 As the planted roof rises out of the nature park, which runs through the master plan, it offers views of nature to everyone in the area. The goal of this roof is to become a haven for all sorts of insects and birds. The design aims to grow the local flower of the region. The hårginsten flower is sadly becoming increasingly rare in the area. The beautiful yellow flowers attract the ginst butterflies (ginst fjärilar), which are also endangered. The roof raises from the level of the nature park up to a maximum height of 18m at the building corners. Views are opened up towards the sky and the naturepark, making the space inside feel less enclosed. 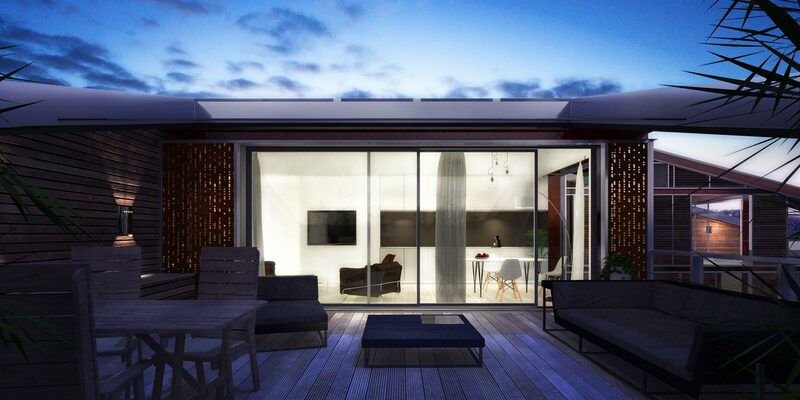 The roof form also allows views into the central space from more of the wider master plan. 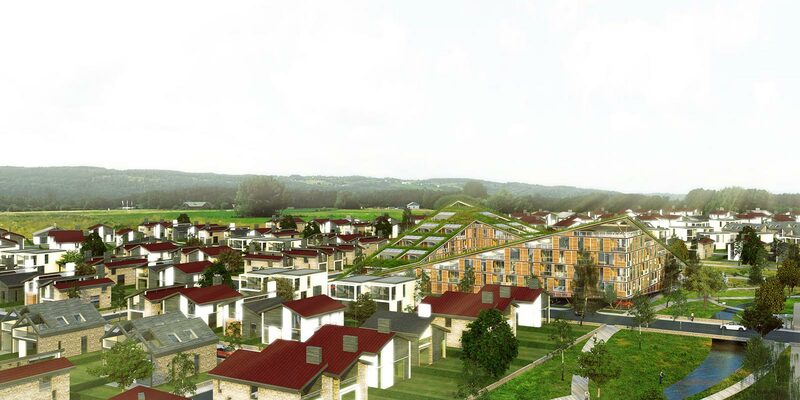 The form enables the buildings themselves to be the local landmark – a distinctive element for masterplan and beyond. Housed below the roof is residential accommodation, which steps back in plan on each floor as the roof raises. At the ends of each building, feature terrace flats are created . Large voids are carved out of the roof to provide light into the private external terraced spaces below. At the top of each building is a communal area. 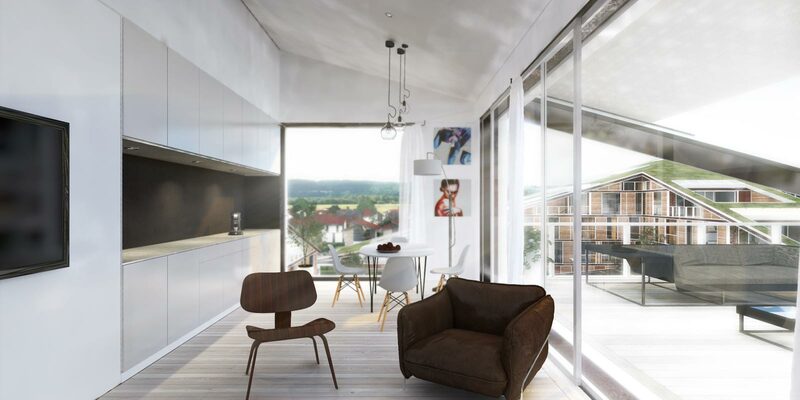 These open spaces offer views across the area and allow residents of each building to socialise. We believe that the building should be natures helping hand, and not something that is only environmentally friendly to build. 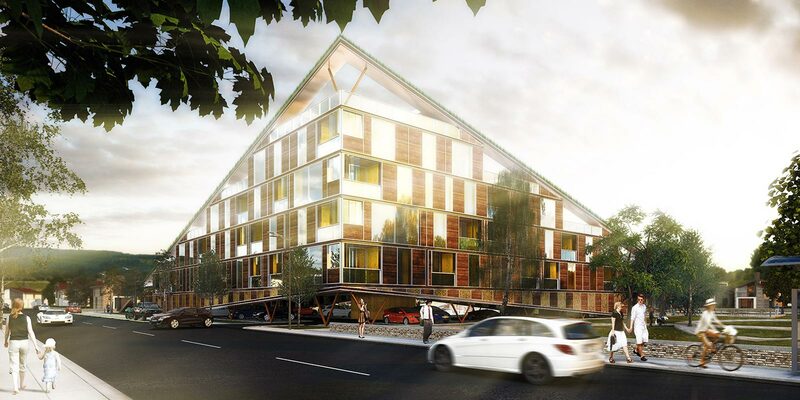 A range of elements have been designing to promote a more environmentally aware environment. Knowing that butterflies obtain their energy from sunlight through their wings, we decided to mimic this by incorporating solar panels throughout the planted roof. Bicycle hire stations have been positioned around the square for use by locals. Further into the naturepark the jetty will house information about the area, especially the nature reserve which boarders the site. Intensive planting will be used throughout the development to create natural boarders and protection zones. The building is set with a simple material palette which aims to integrate with nature, and maximise daylight. 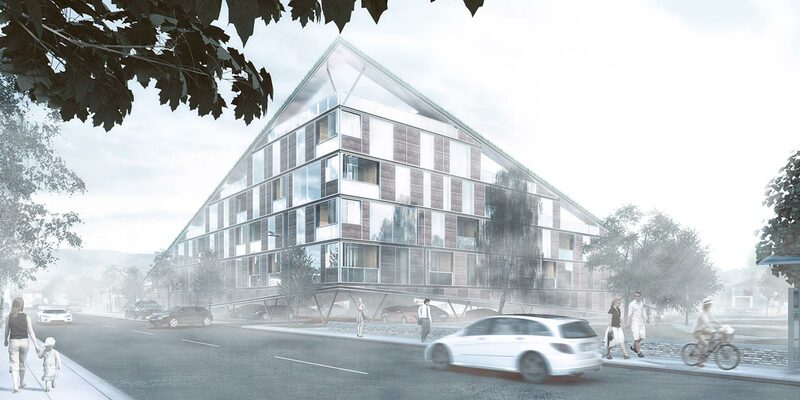 The raised main body of the building is clad in glass and timber. This helps us to make the building respond to its location and create privacy, while also maximising the daylight and flexibility that glass buildings enable. Perforated metal panels have been incorporated on the ground floor to increase permeability, while offering screening benefits to the cars. The main square materials are a mixture of stone and timber. Timber has been incorporated to give a warmer more child friendly feel to some of the spaces. Incorporated within the stone tiles is strip lighting. We have had a great response on social media regarding the design. Thank-you for all the likes. Post by World Architecture News. Post by A As Architecture. Post by My Modern Metropolis.